Eriogonum giganteum lives up to its name by sometimes growing to 10' tall and wide. However, it usually stays at a much more manageable 4-5'. Saint Catherine's lace has an attractive rounded shape and produces masses of large, flat-topped clusters of creamy white flowers in summer that turn to reddish-rown as they age. The flower clusters are similar to those of Eriogonum arborescens (Santa Cruz Island buckwheat), but much bigger - sometimes growing as wide as 1' across - and more open. The flowers resemble lace doilies, hence the common name for this shrub. The flowers can be cut at any time to bring indoors and, when dry, will stay the same color as they were when cut. The gray green leaves are oval and often slightly crinkled. They're covered in silvery-white hairs which give them a fuzzy woolly feel and appearance. The lower branches can be pruned up to make a really attractive specimen shrub. Doing this also makes room for more plants underneath! Saint Catherine's lace is tolerant of many soil types, including clay although it prefers good drainage. Plant it where it'll receive at least half a day of sun. Buckwheats hybridize readily; where Eriogonum giganteum meets Eriogonum arborescens (Santa Cruz Island buckwheat), they frequently hybridize to produce seedlings with characteristics of both parents. 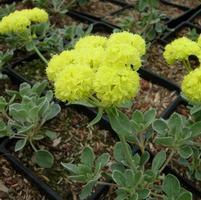 These plants are sometimes available in nurseries as Eriogonum blissianum. Native to dry slopes and ridges in coastal scrub and chaparral below 1,500 feet on Santa Catalina, San Clemente and Santa Barbara Islands off the coast of southern California. Once or twice a year, lightly prune the branch tips to control the size of this shrub and to maintain a pleasing shape. Take care not to neglect pruning duties as older wood doesn't reliably produce new shoots.